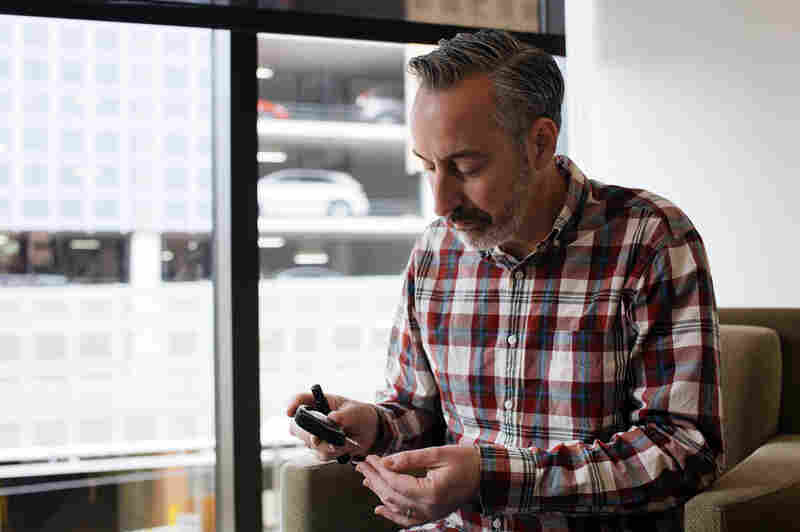 Health Insurers Pay More Up Front To Reduce Costs Later : Shots - Health News Some businesses are keeping costs down for workers by removing deductibles for supplies needed to manage diabetes and other chronic conditions. Michael McBrayer tests his blood sugar before eating lunch. He gets supplies he needs to manage diabetes for free as part of a deal between his employer and health insurer. Michael McBrayer of St. Paul, Minn., needs to pay a lot attention to his health. "I give myself shots multiple times a day, as well as controlling my diet and exercise," he says. "Kidney failure, blindness, heart disease — all those things are looming out there," he says. McBrayer has health insurance through his wife's employer, the state of Minnesota. It's a HealthPartners health insurance plan that charges extra to employers — in this case, the state — to cover diabetes care. So for the past several years, McBrayer's plan has paid for everything he needs to keep his diabetes in check. He doesn't spend a dime on supplies. 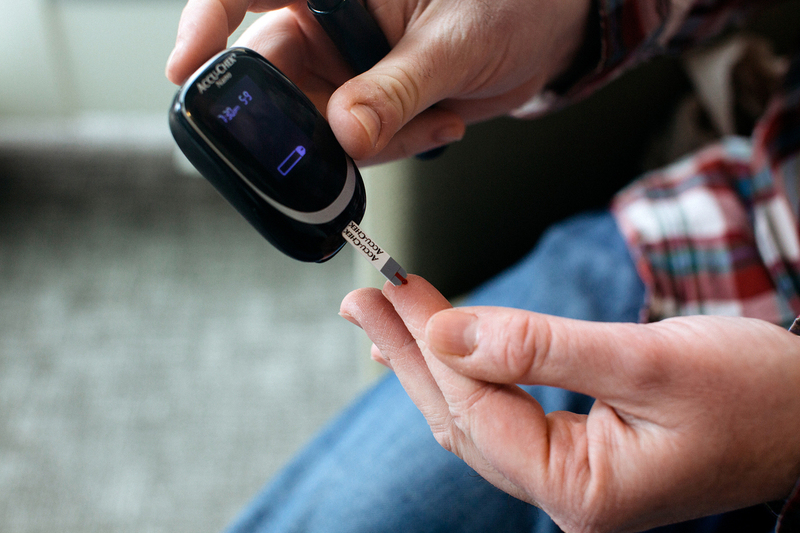 The program that pays for McBrayer's diabetes management supplies has saved the state of Minnesota more than $1 million in medical services over 10 years. Diabetes, high blood pressure and other chronic conditions account for the vast majority of health spending in the U.S., according to the Centers for Disease Control and Prevention. Almost half of American adults have one or more chronic physical or mental health conditions, and spending on them adds up to some $2.3 trillion a year. Some health plans are beginning to offer free maintenance care for people with chronic health problems, hoping that spending a little more early on will save a lot money in the long run. "We've been trying change the health care conversation in the United States from how much we spend to how well we spend," says Dr. Mark Fendrick, head of the University of Michigan's Center for Value-Based Insurance Design. He says it makes both medical and economic sense to make properly managing chronic conditions affordable. "I want the health insurance plan my patients have to charge my patients the least for the services that are going to make them healthier," he says. "Let's allow those to be covered on a pre-deductible basis; you're not leaving the patients paying 100 percent of the cost." That may seem like common sense, but health plans have been running hard in the opposite direction. Consumers are on the hook for a rapidly increasing amount of their health costs — in large part to try to curb health costs. But corporate buyers of health insurance are starting to realize that people may be putting off necessary care, says Mike Thompson, who runs the National Alliance of Healthcare Purchaser Coalitions. The organization advises around 12,000 organizations that buy health plans for tens of millions of Americans. He says those who provide insurance need to take a thoughtful look at what they pay for and what consumers should pay for. "So that people are more prudent on discretionary care but are more compliant with the care they need and certainly the case they need to stay healthy," Thompson says. If people have to pay out-of-pocket for care they might not need, they may think twice, but their day-to-day health needs are taken care of. One major obstacle to this approach, known as "value-based health insurance," is an IRS rule that does not allow free maintenance care for chronic conditions for the 20 million Americans with health savings account-qualified, high-deductible insurance. The enhanced insurance benefit that pays for all McBrayer's Type 1 diabetes maintenance is paying off for state taxpayers, according to HealthPartners, his provider. That program has helped quadruple the number of diabetes patients with optimal care, saving the state about $1 million on medical services since its inception almost 10 years ago, says Dan Rehrauer, a program manager at HealthPartners. "We've shown that we've reduced hospitalization and emergency department utilization, which is exactly what we want to see," Rehrauer says. "You've got a healthy employee and that results in not ending up in the hospital and saving money."